Kellogg Community College will host two Legacy Scholars Application Days this month to assist students from the Battle Creek area with completing processes related to the Legacy Scholars scholarship program. 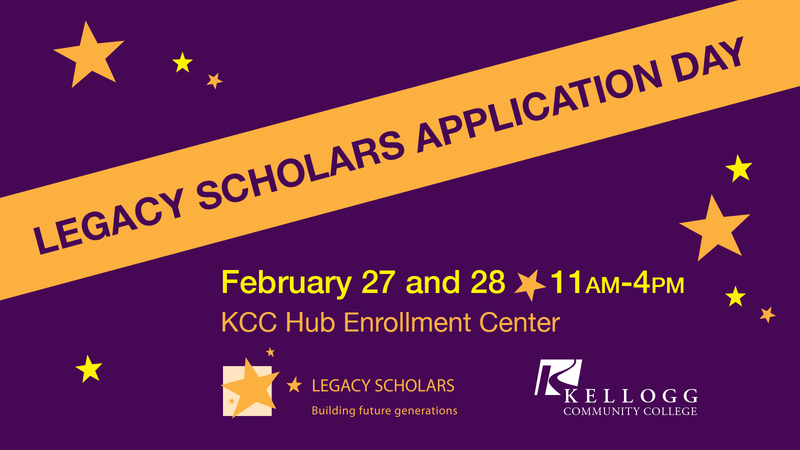 Legacy Scholars Application Days will be held from 11 a.m. to 4 p.m. Tuesday, Feb. 27, and Wednesday, Feb. 28, in the Hub Enrollment Center on campus at 450 North Ave., Battle Creek. The free events will offer students and parents assistance with the Legacy Scholars application process and provide answers to questions about eligibility for the Legacy Scholars program. The application deadline for this year’s Legacy Scholars scholarships, which pay for up to 62 credit hours of tuition at KCC, is March 1. Students and members of the public are invited to stop in anytime during the events, whether they’re completing an application for the 2018-19 school year or are learning about Legacy Scholars for the first time. While attendees aren’t required to bring any documents, completed applications must include the applicant’s transcripts, personal essay and data from the Student Aid Report (SAR) and Expected Family Contribution (EFC), which are part of the Free Application for Federal Student Aid (FAFSA). Legacy Scholars is a scholarship program created in 2005 by the W.K. Kellogg Foundation that provides a last-dollar KCC scholarship for anyone who graduates from Battle Creek Public Schools, the Lakeview School District or Calhoun Community High School. High school students are eligible for Legacy Scholars funding covering tuition, fees and books for up to five years following high school graduation. For more information or to begin an application, contact KCC’s Admissions office at adm@kellogg.edu or visit www.bccfoundation.org/legacy.